I’ve been trying to get some minis assembled. I think I bit off more than I can chew on that. I just finished a Fire Falcon, Adder Prime, Adder A, Adder H, Lancelot, Naga, Executioner E, and Gurteltier. I currently have a Mad Cat III, Timber Wolf C, Timber Wolf D, Timber Wolf Z, Tundra Wolf, Owens, JagerMech, Victor, in various stages of being glued. I still have a Hellion, Mist Lynx B, Kit Fox D, Hellbringer A, Hellbringer C, Hammerhands, Marauder (MAD-4X), and King Crab (KGC-009) cleaned up awaiting glue. I’d like to get them all assembled so I can prime them in the next week or two before the weather makes it more difficult to spray prime things. I will probably end up waiting to build the Summoner Z until later so that will have to get a coat of brush primer. The battle armor I plan to use will also be getting brush primer as I think it will just be easier all around. I hate feet on molded into the base with separate legs and hips with a passion. It will probably be a mini like that which forces someone to build extra arms like Doc Octopus and makes them go mad. I feel better. Sorry for the interruption. Let me get back to what I’ve managed to do since the last edition. The Osteon is done. Last time I talked about the Septicemia sculpt. We will continue that trend and talk about the Osteon sculpts. There are three of them although I only have the Prime and D. I know some people didn’t care for them but I like them. The mini comes with a torso plate that contains the torso weapons. The arms are different between the Prime and the D also. Everything else was the same as far as I remember. I don’t know if the Jaguar follows the same pattern. For the D configuration, I did not install the hand actuators as I didn’t like the look. 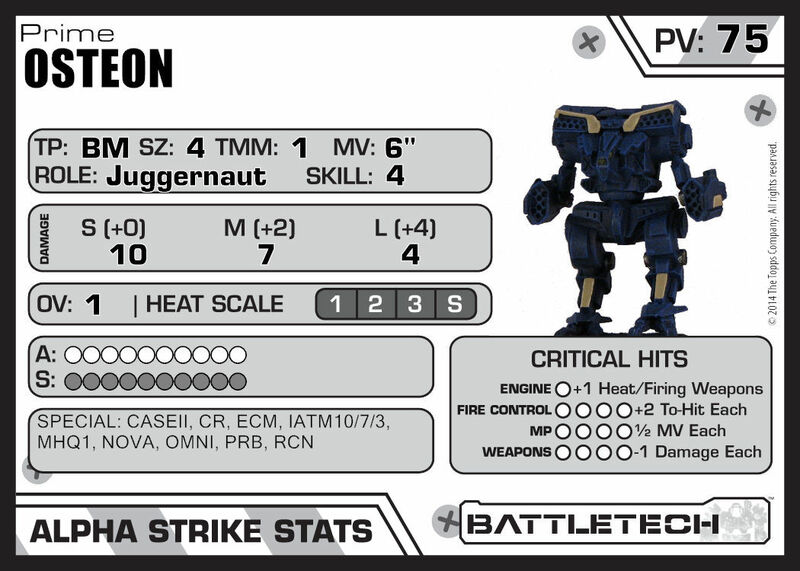 (That configuration is currently two tons underweight so I don’t know if we will ever see errata that adds heat sinks or something else that would necessitate removing the lower arm and hand actuators. 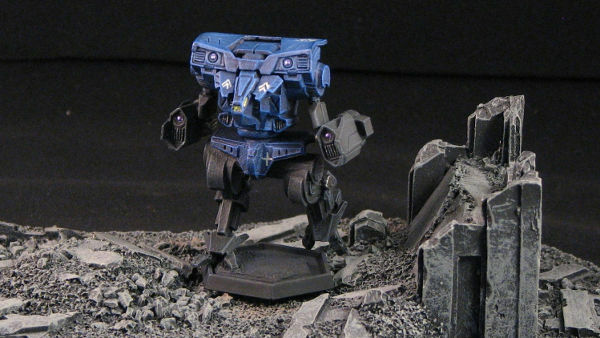 I do want to note that the Cephalus uses a very similar torso plate system for its Prime and D configurations although the leg section was reworked between minis. I think it was for molding purposes. So what does this big boy bring to my little army. It is the slow moving wall of armor and guns. It has NOVA so it can use the range modifiers from the Summoner or Timber Wolf. Unfortunately the long range damage is only 4 points so I’m not going to be hitting hard while camped in the back field. Once I get into medium range, the damage goes up to 7 points with a whopping 10 points at short range. 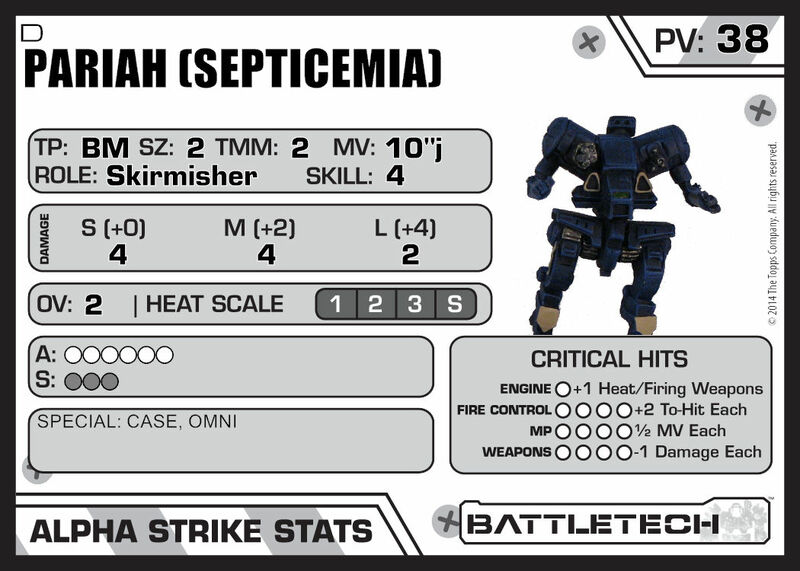 I don’t think this mech will ever get into short range with anybody other than an immobile building or very slow and short ranged infantry. I don’t think anybody would be willing to risk getting hit by that. It could make a pristine Summoner go away in a single hit. 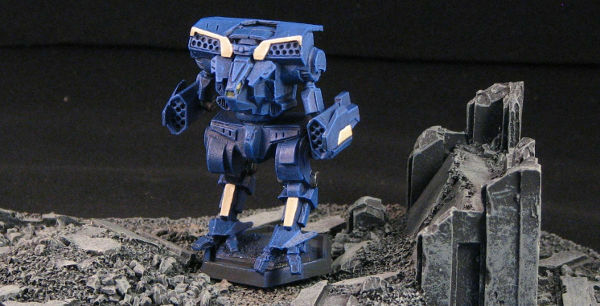 The iATM, which features prominently in my army, does come with some fun features. It will allow me to make indirect fire attacks as if it had an IF special. I could also opt to reduce the damage by one point and use either an advanced inferno (AKA providing a HT attack) or a Magnetic Pulse round. Both of those munitions only work in the short range band. In the case of the Osteon, I don’t think it will be very useful just because most targets won’t be around for the extra goodies to have an effect. Now the Summoner and Timber Wolf are different stories. Looking through the MUL at units with iATM, I see a Mist Lynx that could be very interesting to use. As I mentioned before, the Osteon includes the Society’s wonderful NOVA system. It behaves like a C3i system but cannot be jammed by anything other than another NOVA system. (This was brutal in our Society vs WoB game from a few years ago but that was under the Total Warfare rules.) Unfortunately, it is limited to three units being linked together and unlike the version under Total Warfare that can switch configurations every turn, it is limited to how it is configured at the beginning of the game. I expect the more nimble Summoner and Timber Wolf to provide the easier shots. The Summoner will be trying to get within short or medium range to utilize its damage. That is all I have for this week. I’ve included the picture of the Osteon Prime for this army and also the Osteon D for comparison.